Feel smart, BE SMART in this slouch designed for comfort and style. With unusual construction and simple shaping, the Be Smart Slouch will quickly become a fave! Called ‘Be Smart’, because you will look ‘smart’ and stylish wearing this beanie. The ribbed cuff is long and provides the option to wear it ‘flat’ or turned. Starting with the sideways rib, the construction can be achieved without any cut yarn. Beginners can complete this if they’re willing to stretch their skills. Create in one color, 2 colors, or variegated yarns to achieve different effects. The Be Smart Slouch Crochet Pattern has been tested by independent crocheters (some of their amateur photos are in the gallery). The Be Smart Slouch is also available as part of the Be Smart Set. The set also includes the Be Smart Mitts. I designed this pattern specifically to highlight the gorgeous texture and colors in 8ply Zara from Filatura Di Crosa for my friends at The WoolShed Manuka. 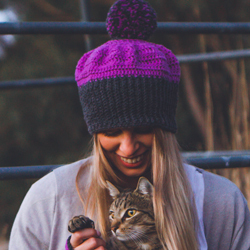 The 100% Extra Fine Merino Superwash yarn creates a super soft, pliable fabric which is perfect for the slouchy style of this beanie. For the pictured set, I used 3 balls of Zara in color 46 (purple) and 3 balls of Zara Melange in color 1468 (slate). Foundation Single Crochet (Fsc) – can be substituted for ch +2st and sc row, if you prefer. Chainless Starting Double Crochet (CSdc) – can be substituted for ch3 throughout, if you prefer. Foundation Double Crochet (Fdc) – can be substituted for ch +2st and dc row, if you prefer. Chainless Starting Treble Crochet (Cstr) – can be substituted for ch3 throughout, if you prefer.